Manual backup of important data from the machine can be a tedious, time consuming and difficult process for some people especially those who are non-tech savvy. To make life simpler and easier, automatic backup software such as USBFlashCopy probably can be a great savior. 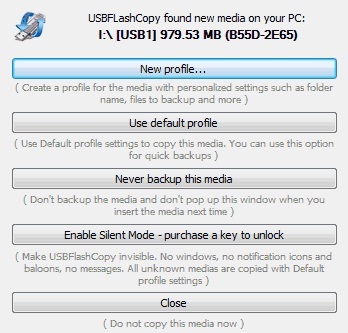 For Windows only, USBFlashCopy is a handy backup tool that can automatically backup users’ USB flash drives, storage cards and other portable storage devices when users connect or plug them to their machine. USBFlashCopy is available free for non-commercial use. The purchase of this application costs $39.95 and the pay version has additional Silent Mode feature. The Silent Mode allows the backup tool to do backup/copy silently in the background without displaying the copy process indicator. This free backup application is pretty small in size, approximately 300KB and doesn’t require any installation or registry entries to use. Users can just simply download the application via the link here and run the portable USBFlashCopy from any folder or drive. With USBFlashCopy ready, users just need to plug their USB flash drive into their computer. Users will thence be prompted by the backup tool with a few options: New Profile, Use default profile, Never backup this media, and Enable Silent Mode (for pay version only). First time users need to make a new backup profile by clicking onto New Profile. They will be given a number of options to set the backup profile, e.g. copy speed, filter to ignore file type that don’t need backup, where to store the backup, name of the backup, keep the old copy/overwrite, etc. Once the profile has been created, as and when users plug the storage device to the computer, USBFlashCopy will scan and automatically backup the files as per instruction.